Suppose that I am working in an academic area that most of us believe doesn’t really involve ethics. Why ponder ethics in my field of endeavor?Let’s say that area is computer science. Who is to decide what constitutes ethical actions when programming a computer? 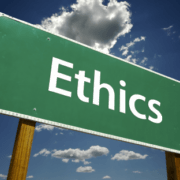 Don’t most of us simply assume that ethics does not apply when we are talking about programming a website? Or programming a robot? Or developing the artificial intelligence that will drive a car? Ethical thinking needs to be, I believe, a part of how any of us approach these efforts. Here is a quote from an article about the ethical training that Harvard is embedding in its computer courses. God Has Something to Say? It’s the humble part that is so dismaying. While doing justice or loving mercy is not so bad, being humble is not a strong suit for anyone. The reason that doing justice is not so bad is our penchant for writing our own definition of justice and then we follow that. To love mercy is not so bad since we very easily join with the ancients in identifying a very limited group to whom we “ought to” show mercy. [I]f we simply use the term “mercy” to refer to certain of the demands of justice (e.g., the demand for individuation), then mercy ceases to be an autonomous virtue and instead becomes a part of … justice. It thus becomes obligatory, and all the talk about gifts, acts of grace, supererogation, and compassion becomes quite beside the point. If, on the other hand, mercy is totally different from justice and actually requires (or permits) that justice sometimes be set aside, it then counsels injustice. In short, mercy is either a vice (injustice) or redundant (a part of justice). It is the subtle interplay between justice and mercy which forms the thinking of a humble ethical person. That interplay is how we ponder ethics. We will examine that further in a future post. https://www.canweknowgodisreal.com/wp-content/uploads/2019/04/ethics.png 312 500 Bob Zomermaand https://www.canweknowgodisreal.com/wp-content/uploads/2018/04/Loge-Idea-Crafting-300x120.png Bob Zomermaand2019-04-02 19:08:422019-04-02 22:48:17Why Ponder Ethics?